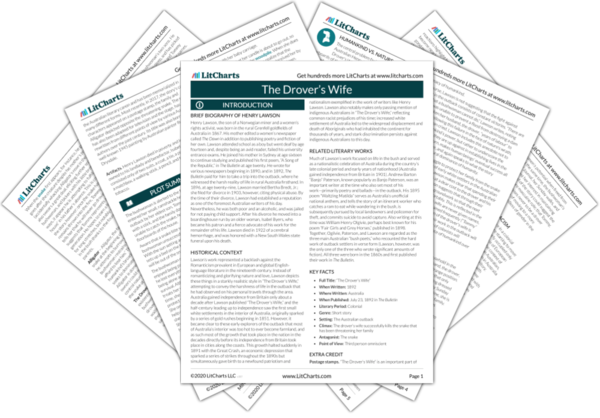 Instant downloads of all 945 LitChart PDFs (including The Drover’s Wife). Welcome to the LitCharts study guide on Henry Lawson's The Drover’s Wife. Created by the original team behind SparkNotes, LitCharts are the world's best literature guides. A concise biography of Henry Lawson plus historical and literary context for The Drover’s Wife. A quick-reference summary: The Drover’s Wife on a single page. In-depth summary and analysis of every of The Drover’s Wife. Visual theme-tracking, too. Explanations, analysis, and visualizations of The Drover’s Wife's themes. The Drover’s Wife's important quotes, sortable by theme, character, or . Description, analysis, and timelines for The Drover’s Wife's characters. 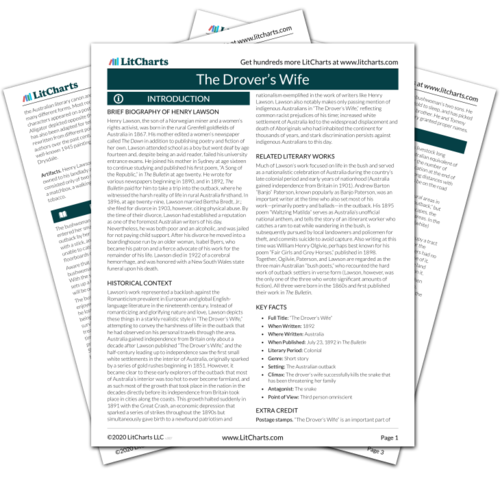 Description, analysis, and timelines for The Drover’s Wife's terms. Explanations of The Drover’s Wife's symbols, and tracking of where they appear. An interactive data visualization of The Drover’s Wife's plot and themes. Henry Lawson, the son of a Norwegian miner and a women’s rights activist, was born in the rural Grenfell goldfields of Australia in 1867. His mother edited a women’s newspaper called The Dawn in addition to publishing poetry and fiction of her own. Lawson attended school as a boy but went deaf by age fourteen and, despite being an avid reader, failed his university entrance exams. He joined his mother in Sydney at age sixteen to continue studying and published his first poem, “A Song of the Republic,” in The Bulletin at age twenty. He wrote for various newspapers beginning in 1890, and in 1892, The Bulletin paid for him to take a trip into the outback, where he witnessed the harsh reality of life in rural Australia firsthand. In 1896, at age twenty-nine, Lawson married Bertha Bredt, Jr.; she filed for divorce in 1903, however, citing physical abuse. By the time of their divorce, Lawson had established a reputation as one of the foremost Australian writers of his day. Nevertheless, he was both poor and an alcoholic, and was jailed for not paying child support. After his divorce he moved into a boardinghouse run by an older woman, Isabel Byers, who became his patron and a fierce advocate of his work for the remainder of his life. Lawson died in 1922 of a cerebral hemorrhage, and was honored with a New South Wales state funeral upon his death. 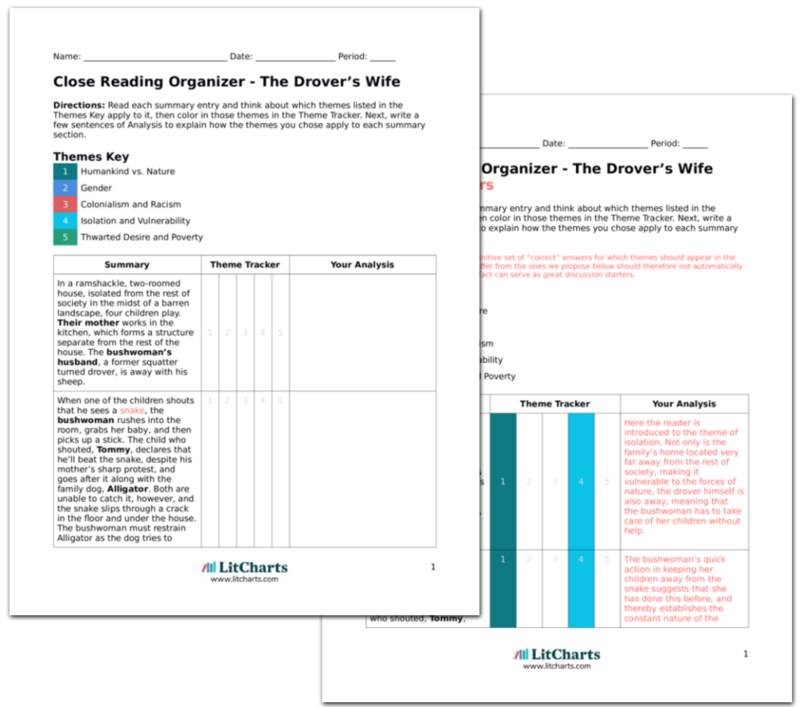 Get the entire The Drover’s Wife LitChart as a printable PDF. Lawson’s work represented a backlash against the Romanticism prevalent in European and global English-language literature in the nineteenth century. Instead of romanticizing and glorifying nature and love, Lawson depicts these things in a starkly realistic style in “The Drover’s Wife,” attempting to convey the harshness of life in the outback that he had observed on his personal travels through the area. Australia gained independence from Britain only about a decade after Lawson published “The Drover’s Wife,” and the half-century leading up to independence saw the first small white settlements in the interior of Australia, originally sparked by a series of gold rushes beginning in 1851. However, it became clear to these early explorers of the outback that most of Australia’s interior was too hot to ever become farmland, and as such most of the growth that took place in the nation in the decades directly before its independence from Britain took place in cities along the coasts. This growth halted suddenly in 1891 with the Great Crash, an economic depression that sparked a series of strikes throughout the 1890s but simultaneously gave birth to a newfound patriotism and nationalism exemplified in the work of writers like Henry Lawson. Lawson also notably makes only passing mention of indigenous Australians in “The Drover’s Wife,” reflecting common racist prejudices of his time; increased white settlement of Australia led to the widespread displacement and death of Aboriginals who had inhabited the continent for thousands of years, and stark discrimination persists against indigenous Australians to this day. Much of Lawson’s work focused on life in the bush and served as a nationalistic celebration of Australia during the country’s late colonial period and early years of nationhood (Australia gained independence from Britain in 1901). Andrew Barton “Banjo” Paterson, known popularly as Banjo Paterson, was an important writer at the time who also set most of his work—primarily poetry and ballads—in the outback. His 1895 poem “Waltzing Matilda” serves as Australia’s unofficial national anthem, and tells the story of an itinerant worker who catches a ram to eat while wandering in the bush, is subsequently pursued by local landowners and policemen for theft, and commits suicide to avoid capture. Also writing at this time was William Henry Olgivie, perhaps best known for his poem “Fair Girls and Grey Horses,” published in 1898. Together, Ogilvie, Paterson, and Lawson are regarded as the three main Australian “bush poets,” who recounted the hard work of outback settlers in verse form (Lawson, however, was the only one of the three who wrote significant amounts of fiction). All three were born in the 1860s and first published their work in The Bulletin. Postage stamps. “The Drover’s Wife” is an important part of the Australian literary canon and has been memorialized in many different forms. Most recently, in 2017, the story’s cast of characters appeared on a postage stamp, the family and Alligator depicted opposite the threatening snake. The story has also been adapted for television and the stage, has been rewritten from different points of view by various Australian authors over the past century. Its title was also borrowed for a well-known 1945 painting by Australian painter Russell Drysdale. Artifacts. Henry Lawson died in poverty and left everything he owned to his landlady and benefactor, Isabel Byers. This consisted only of two suits, a coat, a tie, a pipe, a pair of glasses, a matchbox, a walking-stick, a pencil, and two packets of tobacco. McConnell, Reed. "The Drover’s Wife." LitCharts. LitCharts LLC, 28 Mar 2019. Web. 23 Apr 2019. McConnell, Reed. "The Drover’s Wife." LitCharts LLC, March 28, 2019. Retrieved April 23, 2019. https://www.litcharts.com/lit/the-drover-s-wife.